The question to ask here is how each aspect of God’s grace ties into job descriptions. When writing a job description we try to think of all the responsibilities that must be accomplished in a given ministry position. Very likely, any job description will fail to list every single possible task a person might encounter. If not careful, we can get so consumed in providing a detailed description that we put people in straightjackets. Here’s where the sufficiency of God’s grace comes in. Can we trust that God will bridge any gaps we might leave between what’s on paper and what people need to do? Can we rely on the power of His grace to creatively work in and through people’s lives to see what needs to be done and do it even if we didn’t include that task on their written description? Or, are we using job descriptions to micromanage people? Job descriptions help us in the recruitment process when they include the needed qualifications. Does the person have the qualities needed for that ministry? Are they not only saved by grace but have also experienced His grace leading to spiritual victories in their lives to “be” who they need to be to effectively minister in this way? If they aren’t quite where they should be, do we see a humility or teachable spirit in them to yield to God’s grace? 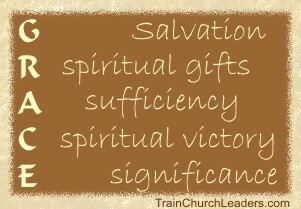 Does the person have the spiritual gifts most beneficial to that ministry? Are we looking for people best suited to “administer God’s grace in its various forms” (1 Pet. 4:10)? Job descriptions can be useful tools when doing staff evaluations. When affirming people for a job well done, we want to make sure we acknowledge how their significance comes because of God’s grace not how successful they were. Remember how Jesus affirmed the 72 when they came back from a ministry endeavor excited about the results. Jesus acknowledged the good but went on to say, “However, do not rejoice that the spirits submit to you, but rejoice that your names are written in heaven” (Lk. 10:17-20). When dealing with ways people aren’t meeting up to their job descriptions, we need to reaffirm how God’s grace is sufficient to help them rise above their weaknesses. Stress the need for change due to God’s grace at work in and through them not merely a self-improvement plan. As a leader, you need to reinforce this truth in the way you write and use job descriptions, but also by stressing how ministry is accomplished through God’s grace. Pray for people as they fulfill their job descriptions. Encourage them to lean into God’s grace that not only saves them but also empowers them for ministry. Emphasize how God’s grace is sufficient for their weaknesses or when stretched beyond their comfort zone, powerful enough to help them overcome trials and temptations they might face as they serve, and enough to give them perspective when starting to feel insecure or uncertain. — Yes indeed, God’s grace ties into job descriptions!